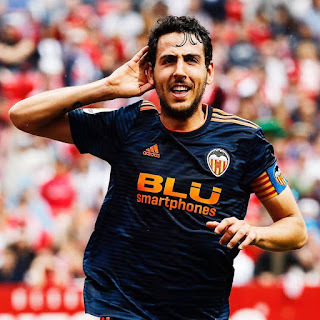 Valencia achieve a key victory at the difficult stadium of a hated rival, achieving "il sorpasso" - overtaking them in the process due to a better head to head record. No mean feat when you remember that the week before Christmas, Sevilla were 12 points ahead of us. The team's better form this year has been helped by a short injury list. 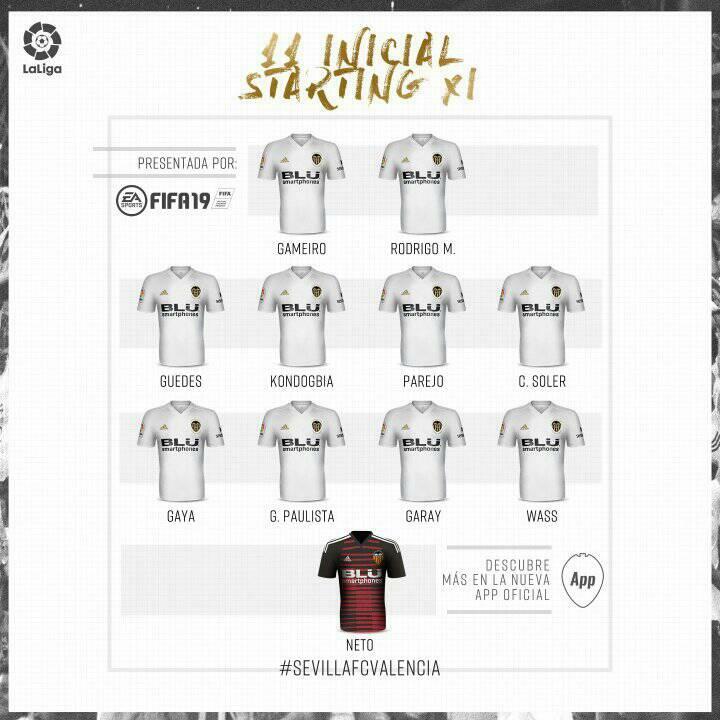 Jaume, Piccini and Coquelin were the only absentees today, meaning we were able to select a strong team. I thought Marcelino might have been tempted to play Gabriel on the right to counter the threat of Promes, but it was a straightforward enough line-up, and the first choice pairing of Gabriel-Garay had a good game. Sevilla got out of the blocks quickest and had us under pressure in the first 10 minutes, but after weathering the storm Valencia controlled most of the rest of the half. Disappointingly nothing much came of it. Soler had an excellent moment, beating 2 defenders and sending the ball across the box but all the players were waiting for a pull back. When a similar chance arrived later in the half, the players were instead attacking the 6-yard box when the ball was pulled back (!) The team also screwed up a couple of breakaways. In one of them, Gameiro dawdled too long and the chance went and the second, in the second half, saw a 3 on 2 break, but Rodrigo took the wrong option of passing to Gameiro and his return pass was deflected just past Parejo. One of several things I didn't like, and I've complained about this before, is that the team seems almost afraid to have a pot shot from distance. We have players like Guedes, Parejo and Kondogbia up against a rookie goalkeeper, a third choice making his debut and our first shot on target is our goal? Seriously? The goal came from an excellent cross field pass by Parejo, with Banega bringing down Gaya for a clear penalty which Parejo easily converted. The first half had seen Wass get owned by Promes and Guedes by Navas, and it was the latter that went off at half-time. Good decision I thought. Valencia's best chance of the second half came from a strong shot by Gameiro from outside the box, precisely the sort of thing we needed to see more of. There's not a lot of good things that can be said about our second half performance. At times it felt like the players had been told not to put more than 2 passes together. We constantly lost the ball, failed to keep composure and suffered from it. There was one ridiculous moment when Cheryshev got the ball on the left and with only one attacker up, still chose to try and find him rather than waste some time holding it up in the corner until support arrived. 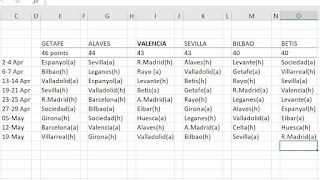 Sevilla made some mystifying substitutions. Amadou and Promes, both of whom had done well were taken off quite early. There was some controversy late on with 2 heart-stopping moments when the ref paused things to check if Sevilla should have a penalty, but both were waved away. I didn't see why Sevilla were so livid about the second: both players tangled in a 50/50. 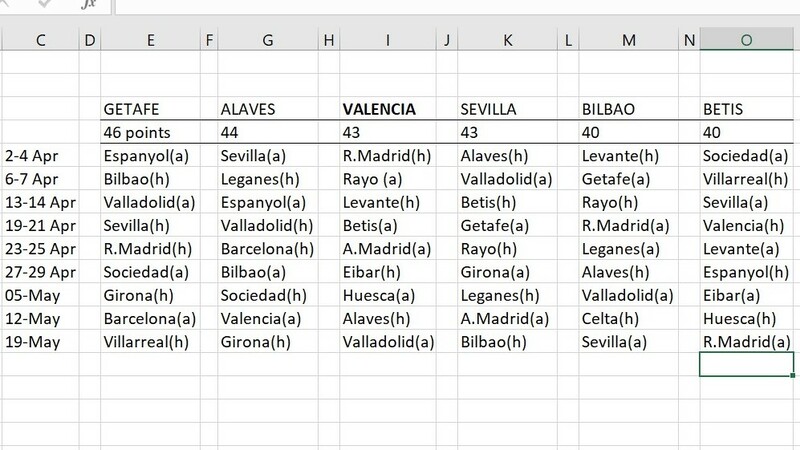 Not sure we deserved the 3 points from that, but it's a huge result, especially with Getafe and Alaves losing and Betis drawing and we are now just 3 points off Getafe, on whom we have a better head to head.